Truth be told, I’ve always had a little bit of a pet-peeve against brands and organizations that use unnecessary letters and intentionally misspelled words in their company names (AJ’s Hot Rodz, Tim’s Pro Cutz Barbershop, etc). However, I’ll make an exception for “CBD Infusionz,” as these guys have got some very legit hemp-based products at some of the most competitive prices in the entire industry. They’ve also got a truly MASSIVE selection of products to choose from though surprisingly, they don’t have any CBD vape selections at all (unfortunately for all you big time “vaperz” out there). I’ve been able to try out the brand’s full-spectrum CBD tinctures, the “CBD Infusionz Chewing Gum,” and the CBD Shatter Slab isolates for my dab rig. Keep reading to see how they stacked up against some of my go-to brands like Pure Kana and Green Roads. CBD Infusionz is a super unique (in a good way) company that’s based out of the (arguable) cannabis epicenter of North America – Denver, Colorado. These guys have not been around in the industry terribly long, but it didn’t take them much time at all to establish a solid foothold in the market. And with ultra effective and uniquely-designed products like “Hemp Joints,” “CBD Shatter Slabs,” and vegan “CBD Health Bites,” it’s no surprise that they’ve been able to accomplish what they have in such a short amount of time. Based in Denver, CO. It sounds a little biased to say it, but basically if you’re a cannabis company that can survive in the cutthroat, “accept-nothing-but-the-best” atmosphere of Denver CO, then you’ve got an excellent pedigree for success in the market – and CBD Infusionz is no doubt one of the top organizations in the area. Good blog. This is kind of an odd highlight to include as it obviously has nothing to do with the quality of their CBD products, but I’ve come to realize that any company who spends the time (and has the knowledge) to maintain a well-run and up to date blog, is a company worth investing your money in. Huge selection of product. This is not to say that CBD Infusionz is a good brand just because they have a huge selection of product – no. Rather, they’re a GREAT brand because they have such a huge selection of product, AND are able to maintain the quality and efficiency over each and every one of them. Very competitive pricing. The first time I shopped around on the CBD Infusionz online store, I was actually pretty surprised by the competitiveness of their prices (nearly 20% cheaper than some of the other top brands across most of their product lineup). Since they had a big reputation well before I ever purchased from them, I figured they would have super high prices. However, the opposite is largely true – top-shelf products at VERY reasonable prices, for the most part. Dry hemp flower. I’ll admit, I used to be a (cigarette) smoker, and I thoroughly enjoy puffing on some dry herb every now again – especially when it’s got therapeutic CBD in it like CBD Infusionz’s “Terpy J” pre-rolled hemp joints. One of the coolest products I’ve seen hit the industry in a long, long time. There are two main things that I was kind of upset with after ordering from CBD Infusionz for the first time: 1) they DO NOT have different flavors to select from for their standard CBD oils; and 2) they do not have any vape products at all (I’m not a huge vaper by any means, but this is still super surprising given such a large and well-established company). As I mentioned in the intro, I’ve been able to try the CBD Infusionz FSO (full-spectrum) oil tincture, the Shatter Slab concentrate, and the CBD chewing gum. First, the chewing gum. I won’t say at all that I was disappointed with it or that it tasted “bad,” but I will say that for $19.99 a pop (no pun intended), I was expecting just a little more in terms of effects. That being said however I was actually feeling pretty good when I tried it, so I really don’t have much to gauge the effects it did have off of. And as far as taste, it’s certainly not awful (I tried the cinnamon), but it’s definitely not the best I’ve had either. The 600mg FSO oil tincture that I used worked absolutely wonderfully, and given that it’s nearly 20% cheaper than the brand I currently use, I’m seriously considering switching over long-term (I used CBD oil almost every day for chronic pain and sporadic migraines, and this stuff worked great for both). Lastly, the only thing that I’ll say about the CBD Shatter Dab isolates is that they’re VERY potent. It of course doesn’t mess up your mind at all or get you high (there’s actually zero THC whatsoever in it), but the calming, almost sedative effects kick in more or less immediately. I actually had my wife try it when she was having a particularly hard night sleeping, and it helped immensely – within 15 minutes she was legitimately sound asleep. 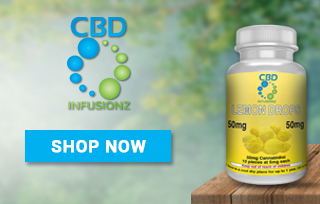 CBD Infusionz has got a HUGE selection of products to choose from. When you click on the “Shop” page on their website, it’s almost overwhelming the amount of stuff they’ve got available. CBD Infusionz CBD Oil Tinctures: So the CBD Infusionz standard oil tinctures come in several different options. Broadly speaking, they’ve got either FSO tinctures (Full-Spectrum Oils), or ISO tinctures (CBD isolates which contain zero THC). The FSO tinctures come in four different potencies (150mg, 300mg, 600mg, and 1200mg), while the THC-free ISO tinctures are infused in MCT oil, and come in the same four potencies. There are no flavoring options with any of the tinctures – they’re only currently available in natural hemp. CBD Infusionz Dry Flower Products: These are pretty unique in the legal CBD industry, but I absolutely love them; Dry Flower Hemp “Joints.” They’re actually from a brand called ‘Terpy J’s,’ but CBD Infusionz must have some sort of a partnership with them. Basically, they’re just like marijuana joints but filled with CBD hemp instead of THC cannabis. Perfectly legal, and will NOT get you high. CBD Infusionz Edibles: CBD Infusionz has a MASSIVE amount of CBD edibles available – it would be entirely counterproductive to try and list every single one of them on here. Basically, they’ve got loads of different gummies and sweets to choose from, hard candies, CBD suckers/lollipops, chewing gum, vegan CBD options, sugar free options, gluten-free options, and some pretty tasty-looking granola style “health bites” that are listed as “natural” edibles. Really, your best bet is to just sort through all of them in the online store yourself and find something (or a handful of things) that look appealing to you. CBD Infusionz Capsules: The CBD capsules are available in full-spectrum (FSO), isolate (ISO), and gel options. The FSO capsules come in bottles of 10, 20 or 30, and each capsule contains 15mg of CBD. 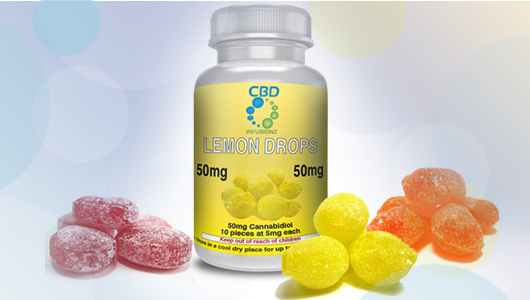 The ISO capsules come in bottles of 25 or 50, and each capsule contains 10mg of CBD. CBD Infusionz Dabs/Concentrates: CBD Infusionz is one of the very few hemp companies who offers a good selection of CBD concentrates that you can use for dab rigs and vaporizers. They’ve got some super potent stuff including 99% CBD Isolate Crystals, CBD Wax, Shatter Slabs, and CBD Powder. CBD Infusionz Topical Lotion/Salve: The topical CBD creams that you can massage into the skin or joint areas come in 2 oz (150mg), 4 oz (300mg), or 8 oz (600mg) tubs. 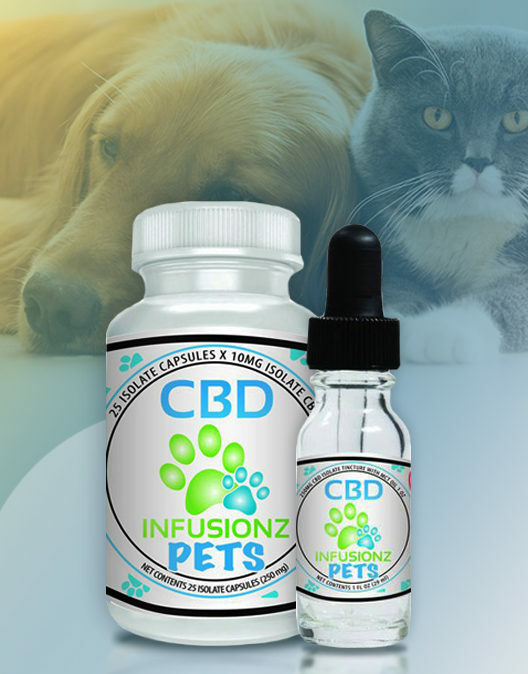 CBD Infusionz Pet Products: CBD Infusionz has an entire page of pet-specific CBD products, including bacon, peanut butter, and cheddar cheese flavored treats, oral hemp tinctures, and FSO capsules, ISO capsules, and gel capsules. CBD Infusionz Dry Flower Products: A single Terpy J Hemp joint is $9.99; 6-packs (which include a cool collectible tin storage can) are $49.99. These legal “hemp joints” contain added terpenes for real-life marijuana joint flavors, but DO NOT contain THC and therefore will not get you high. CBD Infusionz Edibles: CBD Infusionz has a massive amount of CBD candies, gummies, whole grain bars and other edibles options for sale, ranging in price from $19.99-$24.99. CBD Infusionz Capsules: Full-spectrum (FSO) capsules come in bottles of 10 ($29.99), 20 ($34.99) or 30 ($54.99) and contain 15mg of CBD each. ISO (isolate) capsules come in bottles of 25 ($39.99) or 50 ($69.99) and contain 10mg of CBD each. FSO sample CBD gel capsules come in 2-packs for $4.99 (contain 15mg CBD each), and ISO sample capsules come in 2-packs for $3.99 (10mg CBD each). CBD Infusionz Dabs/Concentrates: The 99% CBD isolate crystals come in ¼ g containers (250mg CBD) for $19.99; ½ g containers (500mg CBD) for $25.99; or 1 g containers (1,000mg CBD) for $39.99. ¼ g of Dab Wax is $14.99; 1/2 g is $24.99; and 1 g is $39.99. ¼ g (250mg CBD) of CBD Shatter Slab is $19.99; ½ g is $29.99; 1 g is $49.99. CBD Infusionz Pet Products: The flavored CBD dog treats come in packs of 25 (10mg CBD) for $34.99, the capsules come in bottles of either 25 ($44.99) or 50 ($79.99), and the 1 oz bottles of oil drops (that you can add to their food) come in strengths of either 250mg ($44.99) or 500mg ($79.99). Would I recommend CBD Infusionz? Absolutely. In fact, based on their overall value I would recommend them to complete beginners as well as daily CBD users. Like I said, I’ve been using the same CBD oil tincture for going on three years now, and I’m seriously considering switching over to CBD Infusionz permanently because I get basically the same exact effects, for about 20% less cost. Moreover, they’ve got such a massive product lineup that you’re bound to find something that not only works for you and your situation (including your budget), but also that you enjoy taking. Great brand, great products, and (mostly) great prices — what more could you ask for? After gaining lots of weight in my 20s, I began noticing join pain. I combined a good workout with CBD Infusionz Topical Lotion, and finally I am completely free of joint pain. I’m a bit of a CBD connoisseur, and the CBD Herbal Tonic has not disappointed in terms of flavor. I just wish the bottle looked a little more appealing. I had never tried a vape before, but I enjoyed my first experience with the grape flavored vape – it helped kick my anxiety to the curb. CBD Infusion beats any other CBD manufacturers, in terms of the flavors in their CBD Products. Moreover, they got a plenitude of different gummies and CBD Sweets like hard candies, CBD suckers, lollipops, chewing gum, sugar-free options etc. I found the website a little confusing when trying to find products, but the Hemp dog treats seem to be working well on my little chihuahua. Nasir from Ashburn just bough! Bradley from Ashburn just bough! Delaney from Ashburn just bough!